Squiggle hot on the heels of the lure! 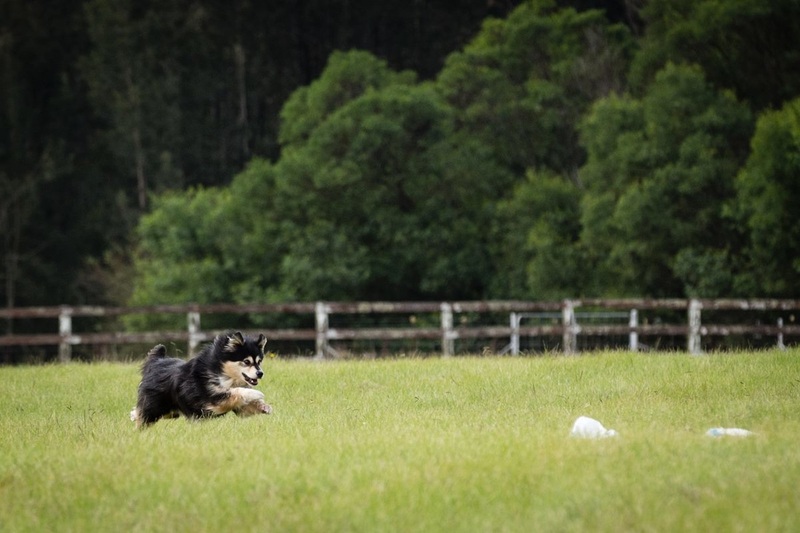 Lure Coursing is a newly ANKC recognised dog sport which involves a dog chasing an artificial lure across a field, in a pattern made to simulate a prey animal (e.g. a rabbit) changing direction as it runs away. The sport was originally developed to test the “eye” of a sighthound (salukis, greyhounds, afghans etc), as well as their speed and agility in chasing down game, which are the breeds’ original purpose, though it has been extended to all ANKC breeds, who compete in different classes to the sighhounds. All dogs must be over 12 months of age to be eligible to compete. The lure itself is a mechanically operated prey item, which looks like a plastic bag, on a wire track. Each competition has a lure operator, who is responsible for operating the machine which drives the lure around the track as well as a hunt master who controls the proceedings on the field and giving the command to “tally-ho” (release the dog) at the beginning of the course and “retrieve your dog” at the end. Dogs are expected to see the lure “running” away from them and give chase. With its recent ANKC recognition, State Canine Control affiliates can now run lure coursing trials, with titles recognised on the pedigrees of eligible dogs. While sighthounds and non-sighthounds have separate classes, all breeds must start with the Junior Coursing Test. Junior Coursing Tests are non-competitive tests where dogs chase a lure without any other dogs on the course. They are judged on their ability to sight and “course” (chase) the lure. Dogs must attend two meets (2 runs at each meet), and score at least 150 points at each meet to be eligible for the JC title and to move onto the next level. After passing the Junior Coursing tests, dogs are then segregated according to breed and aptitude. Sighthounds are eligible for both Single Running Sighthound classes and Competive Coursing, where they will run with other dogs, chasing the same lure at the same time. As we do not have any sighthounds at Pawformance, we will be focusing on the non-sighthound classes, known as CAT (Coursing Ability Test) Competition. CAT Competition measures the dog’s ability to not only chase the lure, but to also do so with enthusiasm and without interruption. Dogs of all levels chase the same lure in CAT Competition, but must achieve more and more passes for the higher titles. Coursing Ability (CA) – The Coursing Ability title requires the dog to obtain 10 passes under a minimum of 3 judges. Passes require 2 runs per meet, with the dog achieving a minimum score of 160. Because of these requirements, dogs must run a minimum total of 20 runs, at 10 meets to be eligible for the CA title. Coursing Ability Advanced (CAA) – The Coursing Ability Advanced title requires the dog to obtain 8 passes under a minimum of 4 different judges after they have achieved their CA title. As with CA, passes require 2 runs per meet with the dog achieving a minimum score of 160. This means that dogs must run a minimum of 16 runs at 8 meets to be eligible for the CAA title. Coursing Ability Excellent (CAX) – The Coursing Ability Excellent title requires the dog to obtain 8 passes under a minimum of 4 different judges after they have achieved their CAA title. As with CA, and CAA, passes require 2 runs per meet with the dog achieving a minimum score of 160. This means that dogs must run a minimum of 16 runs at 8 meets to be eligible for the CAX title. A numbered title (eg CAX2, CAX3) will be awarded for every 5 additional passes after the dogs has achieved its CAX title. This means that dogs can continue to compete indefinitely.